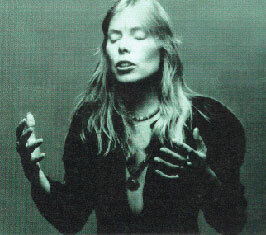 Joni originally wrote the music in 1982 (previously unreleased from the Wild Things Run Fast sessions). "It took me seven years to find words for it. I kept thinking, 'This thing wants to be written in French,' and I had to find the right story for the mood of it. It's a very dramatic melody, full of longing. So, I finally found a story in some magazine about a German aristocrat, a homosexual and friend of [Rainer Werner] Fassbinder, who had a lover in his youth that he never got over. He lost track of him for many years. One day, he discovered that his old flame was working on the docks. He moved out of his fancy digs and into a couple of dingy rooms that overlooked the route where, with his hard hat and his lunch pail, his ex-lover walked to work. He lived to glimpse him twice a day, coming and going. He never approached him." "Two Grey Rooms" hit me so hard when I first heard it - once again, Joni captures such passion and emotion using staccato but well-woven phrases, and envelopes them in deep-reaching tones that make you feel the ache of longing. I'll never tire of listening to it.